North Bohemia is a region in the Czech Republic and it consists of Ústí nad Labem Region and Liberec Region. This part of the country is not a popular travel destination due to lack of iconic and well-known sights. But North Bohemia offers breathtaking sceneries (Bohemian Switzerland National Park, Ceske Stredohori, Bohemian Paradise), where Elbe river flatland meets mountains and creates amazing rock structures, picturesque historic towns as well as some of the best castlesa ad cahteaus in the country. North Bohemia, historically (for more information, see "Understand") heartland of Sudetenland, German area in Czech lands. Cruel and poignant 20th century is noticeable everywhere. From wealthy German villas (often abandoned now) and spas from prosperous pre-war era to Terezin concentration camp and devastated countryside because of communist-era coal mining and heavy industry. Liberec is with pop. 100 000 biggest city in North Bohemia and centre of Liberec Region nestled in the Jizerske Hory, at the foot of the Jested Mountain (1012 meters). In contrast with industrial Decin, Usti nad Labem, Most or Chomutov, Liberec is a lively and beautiful city with big zoo, botanic garden, some good restaurants and more attractions. Most (pop. 70 000)- although old medieval centre was destroyed in favor of coal mining and heavy industry, castle Hnevin and gothic church (which was moved by train to the newly constructed town almost kilometer away; according to the Guinness Book of World Records, it is heaviest building ever moved on wheels) still remain and remind the German past. Děčín - big city (pop. 50,000) on Elbe river with baroque chateau and synagogue in Art Noveau style. Chomutov - another big city with quite nice historic centre with one the oldest gothic churches in Europe. Teplice (pop. 50,000)— city known for its thermal spas. Litoměřice (pop. 24,000) - pretty historic town, seat of the Roman Catholic Diocese of Litoměřice. Dominant of the town is Cathedral of St. Stephen. Česká Lípa (40,000) - centre of Kokořínsko landscape protected area. Image of sandstone rocks in Bohemian Paradise and Trosky Castle on the background. Bohemian Paradise - Favorite summer destination for many Czechs, Bohemian Paradise is a Protected Landscape Area with sandstone rocks and plenty of picturesque castles and chateaux, just ideal for hiking. Prachov Rocks - part of the Bohemian Paradise, beautiful sandstone rocks. 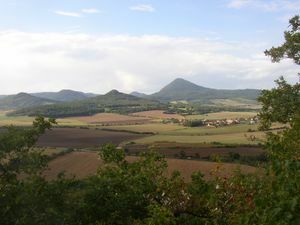 České Středohoří (Central Bohemian Uplands) are different than rest of Czech mountains. The highest peak, Milesovka, is just 800 meters high. What makes this protected landscape area (second largest protected landscape area in the Czch Rep.) beautiful is combination of Elbe river flatland and cone-shape mountains of volcanic origin (difference between highest and lowest point is 700 meters!). You can reach the area easily, because highway connecting Prague and Berlin goes right through it. Bohemian Switzerland National Park Largest natural sandstone arch called "Pravcicka Brana," and other unique sandstone formation are part of the small and picturesque National Park, right on the borders with Germany. Kokořínsko Protected landscape area - another great landscape with amazing rocks, but Kokorisnko offers much more. For example "Czech sea" Macha's Lake (it is actually just a big pond) one of the biggest bodies of water in the Czech Republic, and Bezdez Castle from 13th century. Říp Mountain is just 450 meters high solitary hill rising up from the central Bohemian flatland. It is place, according to legend, where the first Czech people settled. Old rotunda of Saint George can be found on the top. Terezin is a small town and originally military fortress from Habsburg era, best known for Terezin concentration camp. Úštěk, small town locted few kilometres from Litomerice with well preserved gothic houses. Panská Skála - weird rock structure, which looks like an organ, is definitely worth a visit. There is nothing like that in the Czech Republic. It is located in the little town Kamenický Šenov, 17 kilometres from Česká Lípa. Historically, this area was inhabited by Germans, who came upon the invitation by Czech kings in early medieval ages. This area with German majority called Sudety (Sudenetnland) used to be one of the most wealthy and industrialized regions in the during Austria-Hungary and Czechoslovakia between World War I and World War II. In, before beginning of WW II 1938 were Sudeten annexed by Nazi Germany. Right after the War, one of the most controversial event in modern Czech history happened. Whole German population of 3 millions was deported to Germany and was inhabited by Czechs, who had to new land no relation. Today, as a result of German transfer and four decades of communism (part of its landscape was destroyed because of coal mining), this region is one of the most poor parts of the Czech Republic with relatively high unemployment rate. Its more wealthy past remind big German villas, these days often abandoned. North Bohemian landscape is stunning. On borders with Germany and Poland are Ore Mountains (Krusne hory), Lusatian Mountains (Luzicke hory) and Jizera Mountains (Jizerske hory). In contrast, Elbe valley is located here with lowest point in the Czech Republic. Moreover, strange mountains in Central Bohemian Mountains (Ceske Stredohori) of volcanic origin, are there along with rock structures in Bohemina Switzerland National Park. Bus is a good option to get to regional metropolises Liberec and Usti nad Labem and it takes one hour and couple of minutes. Since Usti nad Labem is important railway junction between Prague and Berlin, train is best way how to get there and it takes just one hour from Prague hlavni nadrazi (main railway station). To Liberec, there is no direct train connection from Prague and bus is definitely better option. Both Usti nad Labem and Liberec are well connected with Prague via highway (Usti - D8 motorway, Liberec - R10 expressway). It takes just about 1 hour driving. Railway network is dense in North Bohemia. Using train, you can get to almost every town here. Buses are common too. Great option how to explore many sights in this region is by walk. Lots of beatuful towns, castles ad chateau are located close to each other and are often set in beautiful landscape. Tourist trails are well marked and can be found in every corner of Nort Bohemia. It is possible to see some North Bohemian and Saxon sights (Dresden, Meissen, Königstein) with Labská Plavební , which offers cruises on river Elbe from Děčín and Ústí nad Labem. Cathedral of St. Steven in historic town Litomerice. If you like landscape, go to Bohemian Paradise, České Středohoří or mountains on the borders (see other destinations). These areas are also great for people interested in architecture and history. One of the best and most famous Czech castles (Bezděz, Kost, Kokořín, Frýdlant, Trosky, Houska) and chateaux (Mnichovo Hradiště, Frýdlant, Jilemnice, Zákupy, Hrubá Skála and many, many more) can be found there. Although big North Bohemian cities can one called ugly, smaller towns are surprisingly beautiful. Jičín, Kadan, Louny, Žatec, Litoměřice, Roudnice nad Labem, Úštěk or Chomutov has well preserved gothic and baroque historic centres. If you prefer modern architecture, you should not miss Jested Mountain with Jested Tower on the top of the mountain. This is one of the best Czech buildings built during Communism and is well known among foreign architects due its hyperboloid shape, which naturally extends the silhouette of the hill. Moreover, there are great views of Liberec city and whole Bohemia as well. Network of walking trails is dense and trails are well marked. Moreover, landscape is just beautiful, with sandstone rocks and many castles and chateaux (look at the See section above). Bohemian Paradise is most popular destination and there is plenty of places, where you can rest, eat, sleep or buy a souvenir. However, in summer could be a bit crowded. Biking is also popular due to flatland located here. However, cykling some mountains in České Středohoří or Jizera Mouinains can be more challening. You can swim and sunbathe on shores of Machovo jezero (Macha's Lake) in Kokořínsko landscape protected area. Why go by foot, if you can borrow canoe, kayak or inflatable boat and follow many Czech tourists on Ohře and Jizera rivers. Due to several mountains on borders with Germany and Poland, there are few small ski resorts. 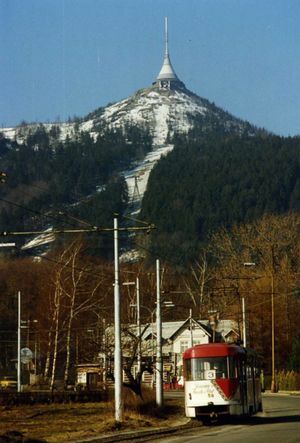 Bedrichov, Bila and Severak around Liberec. In North Bohemia are several local breweries. Area around Žatec is well known for prodution of hops. In Žatec is museum about hops and breewing. North Bohemia has an above average criminality than rest of the Czech Republic. In some bigger cities in Usti nad Labem Region, there are ghettos (for example Chanov quarter in Most) with population of Roma. Avoid these places. 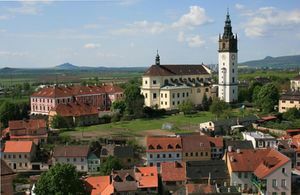 Your next destination could be Prague, Pilsen and spas in West Bohemia, Krkonose Mountains and some beautiful cities in East Bohemia or Germany (Sachsen).